"Shreevatsa" redirects here. For the child care centre, see Shreevatsa (Pune). The compound Buddhist symbols: shrivatsa within the Three Jewels over a chakra on the Torana gate at Sanchi. 1st century BCE. The Shrivatsa (Sanskrit श्रीवत्स śrīvatsa) is an ancient symbol considered auspicious in Indian religious traditions. Srivatsa means "beloved of Sri", the goddess Lakshmi. It is a mark on the chest of Vishnu where his consort Lakshmi resides. It is said that the tenth avatar of Vishnu, Kalki, will bear the Shrivatsa mark on his chest. It is one of the names of Vishnu in the Vishnu Sahasranamam. 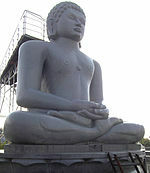 Srivatsa is a popular name in Andhra Pradesh, Telangana, Tamil Nadu and Karnataka. 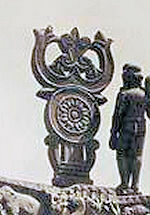 In South India, the bronzes made after circa 10th century, the Srivatsa symbol is shown as an inverted triangle on the right chest of Vishnu and his various incarnations. In Buddhism, the Srivatsa is said to be a feature of the tutelary deity (Tibetan: yidam) Manjusri the Youth (Skt: Manjusrikumarabhuta). 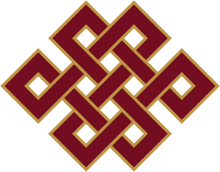 Tibetan Buddhists depict the shrivatsa as a triangular swirl or an endless knot. In Jain iconography, Shrivatsa often marks the chest of the Tirthankara image. It is one of the Ashtamangala (eight auspicious symbols) found in Jainism. The canonical texts such as Hemchandra's Trīṣaṣṭiśalākāpuruṣacaritra and Mahapurana mentions it as one of the Ashtamangalas. Acharya Dinakara explains in his medieval work that the highest knowledge emerged from the heart of Tirthankaras in the form of Shrivatsa so they are marked as such. In North Indian Jain sculptures of the early centuries, it is marked in the centre of the chest. The shrivatsa is the symbol of Rakhine State and the Rakhine people of Burma. ^ Jain & Fischer 1978, p. 15, 31. ^ Rai Govind Chandra (1 December 1996). Indian symbolism: symbols as sources of our customs and beliefs. Munshiram Manoharlal Publishers. p. 37. ISBN 978-81-215-0081-4. Sutton, Nicholas (2000). Religious doctrines in the Mahābhārata. Motilal Banarsidass. p. 153. ISBN 9788120817005.